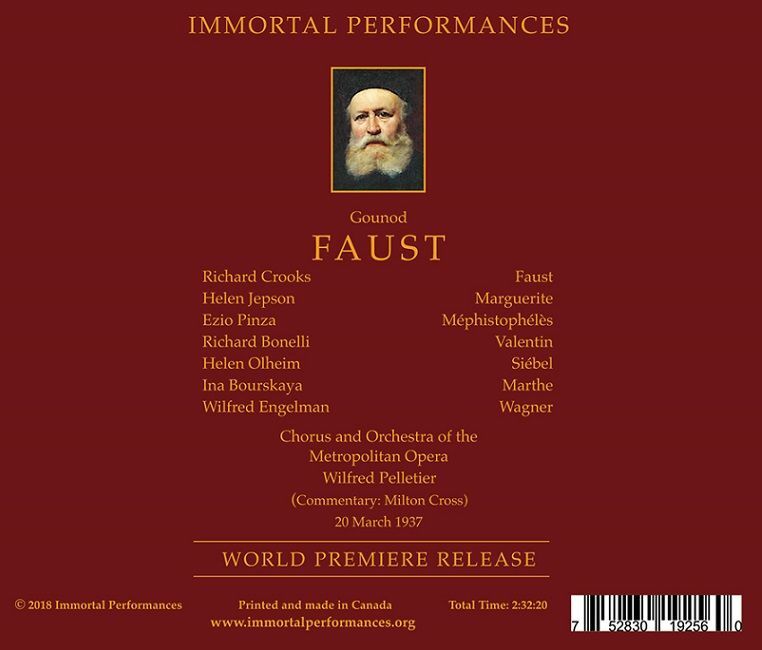 “My colleague Henry Fogel opens his liner notes for this new Immortal Performances release by exclaiming: ‘What a discovery this FAUST is!’ I agree wholeheartedly. It appears to be a first ever issue of a March 20, 1937 Metropolitan Opera broadcast of Gounod’s operatic masterpiece, featuring a stellar cast and conductor, reproduced here in excellent sound for its source and vintage. 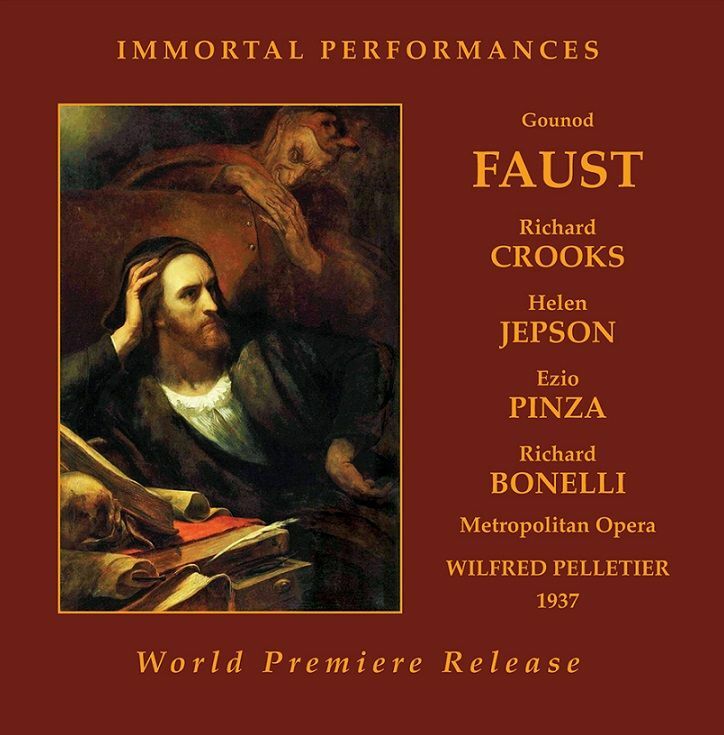 I will go into further detail, but I’ll say at the outset that if you are at all interested in historic recordings of Gounod’s FAUST, this belongs in your collection. Collectors may already own an April 6, 1940 Met broadcast from Boston, featuring the same conductor, and lead soprano, tenor, and bass. The 1940 broadcast is first-rate, but it is a true gift to have this 1937 performance capturing the principal artists in even fresher, more youthful voice. The Faust is American tenor Richard Crooks. 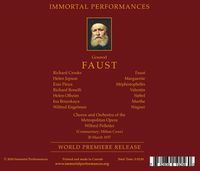 If you are not familiar with Crooks’ artistry, this FAUST broadcast represents a superb introduction. Crooks possessed a beautiful lyric tenor voice that soared easily into the upper register, and possessed ample power….Crooks was an especially persuasive exponent of the French lyric tenor repertoire. His French diction was clear and idiomatic, and Crooks sang this repertoire with great style, and a wide-ranging palette of vocal colors and dynamics. Crooks was also a highly accomplished interpreter of songs (both classical and popular), and at his best, the tenor brought a Lieder singer’s nuance and detail to his operatic performances. The 1937 Faust broadcast is such an occasion. Rarely, if ever, have I heard a tenor perform the opera’s opening scene so persuasively….Crooks is sensitive to every nuance as Faust reflects upon (and ultimately rejects) his life, finally invoking Satan. As the young Faust, Crooks is poetic, sensitive, passionate, and, in the end, overcome with remorse. It’s a marvelous demonstration of first-rate singing and vocal acting. Indeed, among vintage interpretations, it is a Faust worthy to be placed alongside Georges Thill and César Vezzani. Ezio Pinza sang the role of Méphistophélès almost 60 times during his storied Met career. It’s not surprising that the role fit the Italian bass’s glorious vocal attributes, charisma, and handsome stage presence like a glove. Indeed, Pinza would have been a great success in the role had he chosen merely to stand and deliver one glorious tone after another. But if Pinza’s French diction is not quite as idiomatic as Crooks’, the bass, too, offers a stylish, nuanced performance with all kinds of delightful touches. Pinza never descends into bombast, slapstick, or caricature. Instead, we have a Devil who is by turns charming, seductive, menacing, and cruel. Pinza is also in superb voice, which is to say, one of the finest lyric bassos of the 20th century….Helen Jepson brings numerous strengths to her convincing portrait of Marguerite. Jepson’s voice is attractive and secure, and she does an admirable job of portraying the tragic heroine’s transformation from an innocent girl to a passionate young woman, ultimately betrayed by her lover. What Jepson lacks, especially in comparison to Crooks and Pinza, is individuality of approach. Richard Bonelli is a rich-voiced, first-rate Valentin. Both Helen Olheim as Siébel and Ina Bourskaya as Marthe acquit themselves with distinction. Wilfrid Pelletier conducts with an arresting respect and affection for the score. This was a time when FAUST was both a staple of the repertoire, and generally considered a masterpiece. Pelletier approaches the work with that level of esteem, reveling in the orchestral colors, and pacing the opera in a manner that allows for the utmost expression, dramatic flow, and momentum…. Richard Crooks was rarely recorded, to posterity’s loss, and consequently he has been under-appreciated. This performance shows him not only to have been a first-rate lyric tenor vocally, but also a consummate stylist. He produces a true French tenor sound, with the requisite slightly nasal twang, and his pronunciation and diction in the language are immaculate. He invests his part with wonderfully subtle dynamic shadings, above all in ‘Salut! Demeure’ where he miraculously gives a totally musical rendition utterly free of any vulgarity, over-emoting, or playing to the gallery, capped with a lovely and perfectly high B-sharp (the aria was taken down a half-step) that is gently floated rather than belted out. Only Jussi Björling tops him in this role among subsequent singers, and I frankly cannot think of another who is even his equal. While not as subtle an interpreter as her two male colleagues here, [Helen Jepson] has a beautiful, well-schooled, and well-supported voice and likewise displays excellent diction and pronunciation. Her coloratura technique is completely secure, and her womanly but not matronly tone is welcome in a part that often is cast with more girlish soubrettes. The ballad of the King of Thulé and succeeding Jewel Song are expertly dispatched, and Jepson strikes just the right notes of fear, panic, and exaltation in the fourth act church scene and the fifth act finale in prison. Ezio Pinza is of course a unique vocal phenomenon. Although his French is heavily accented, that is a trivial concern when set against his command of every nuance of his role. By turns suave, debonair, sly, defiant, mocking, menacing, and ultimately frustrated in defeat in his combat against heavenly forces, he is the very personification of Gounod’s demonic anti-hero. Arguably only Pol Plançon and Marcel Journet outrank him in the part, and that by very little….He rivets attention not just in his big arias, but in all the smaller bits as well: his bantering dialogue with Faust and Marthe, or his gorgeous invocation of night just before Faust succeeds in winning Marguerite’s heart. Once heard, a collection of opera recordings without Pinza’s Méphistofélès becomes unthinkable.